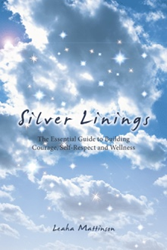 Leaha Mattinson’s “Silver Linings: The Essential Guide to Building Courage, Self-Respect and Wellness” (published by Balboa Press in October of 2016) is set for a new marketing campaign this 2018. This self-help book is aimed at providing hope for families with neurological disease – Huntington’s, Alzheimer’s, Parkinson’s as well as other degenerative illnesses that affect physical, mental, spiritual and emotional wellness. “Silver Linings” is an inspiring story about overcoming adversity at its highest level. Mattinson is gene-positive for Huntington’s disease (HD), an inherited neurodegenerative disease where every child of HD gene carriers is at risk, where 100 percent of people who inherit the disease die. It slowly kills multiple family members at once. Its symptoms are Alzheimer’s, Parkinson’s, amyotrophic lateral sclerosis (ALS) and schizophrenia all rolled into one cruel disease. It goes on for generation after generation forever. There is no treatment. There is no cure. Mattinson reveals her “best odds” plan for taking control of one’s destiny and becoming as healthy and joyful as possible every day. The book shows the reader a different way to think about wellness – to learn non-pharmacological options to wellness and to persevere without letting circumstances define them. Moreover, it guides readers to create their own story of courage. Her personal journey is a story of hope, healing and inner strength. “You can be well mentally, physically, emotionally and spiritually. All of the power lies within you. It’s our personal journey here that’s unfolding every moment that makes this adventure so amazing, so full of possibilities! So let yourself create joy and love, not fear. Trust that nature is working towards wellness. Learn the art of presence. Find ways to be reverent, full of gratitude – and learn to cultivate a healing body, heart and mind,” Mattinson reminds readers. Leaha Mattinson is a Thought Coach, author and radio show host who “walks her talk.” Her internationally adored radio show Master Your Life reaches a global audience who are striving for leading-edge healing insight, intelligence and inspiration. Mattinson is a mother and grandmother who lives in, Alberta, Canada. To learn more about her work; the show, upcoming wellness webinars, live retreats and how to connect with Mattinson for speaking engagements, readers can visit her website at leahamattinson.com.